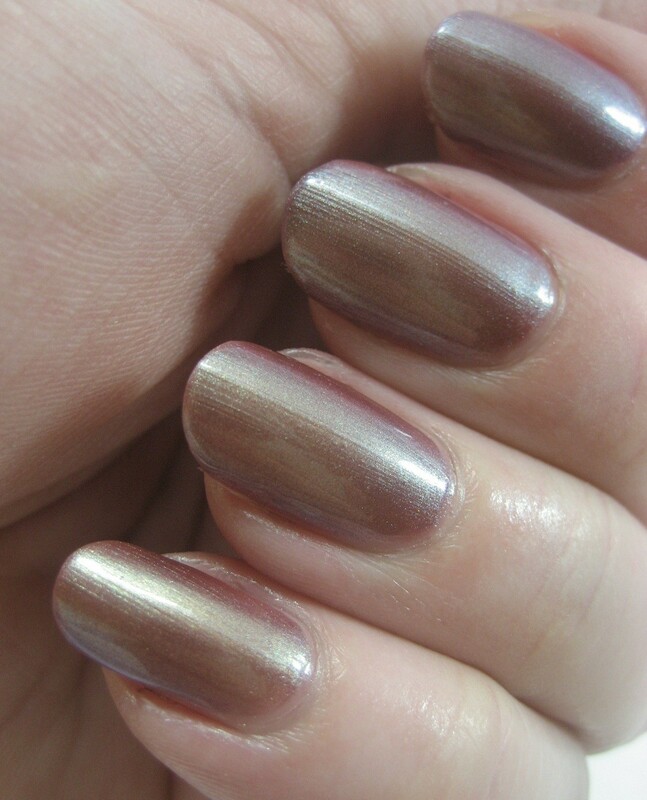 The polish I have to share today is my first from the Deborah brand (or maybe I should say Deborah Milano, like I do Butter London). I got this in a swap with the alla menta, who included it a surprise for me because she remembered I'd commented that I liked it. So thoughtful of her! She sent many other pretties, too, but those will have to wait for other entries; today it's all about the mysterious Rainbow Blazer. I say mysterious because this a multi-chrome that likes to tease the camera and not necessarily give up all its secrets to that mechanical eye. 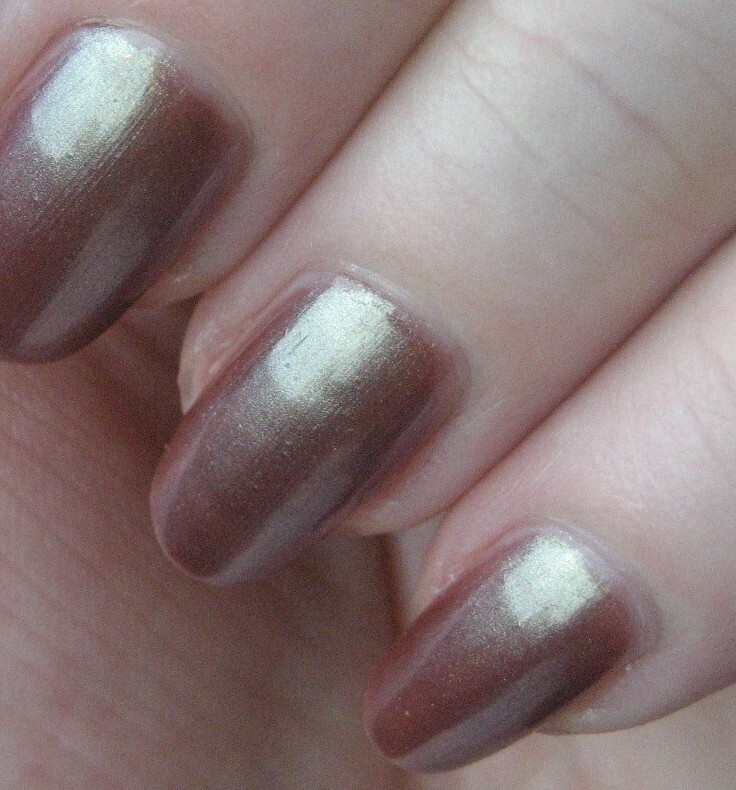 On my nails in my lightbox, it sometimes looked warm and toasty (and more frosty than shimmery), but then I'd turn my hand and see plum and gold (and green? or is that blue?) with shimmery bits twinkling at me. 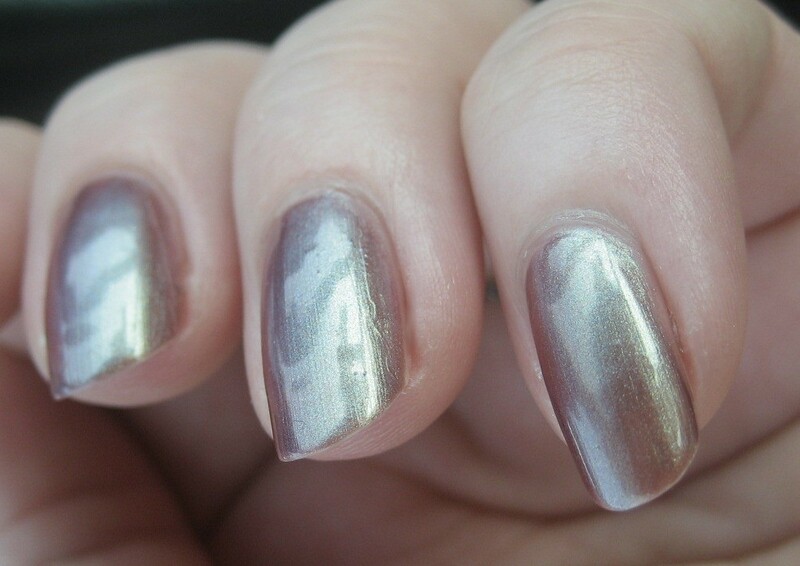 I used two coats; three would probably have been better but I didn't want to use up this beauty too quickly. This was so fascinating to look at that I wasn't tempted to add glitter or decals or crack or anything. Apothica has very kindly stepped up to sponsor a giveaway for a $25 gift card for readers of this blog; if you win, you can use the funds for your own Paul & Joe or any of the other products they carry. To enter, do at least one of the options shown below and then tell me about it on the Google Docs form at the end of the entry. If you do all three options plus the bonus activities for each one, you could get up to six chances in the drawing. b. Contest is open to U.S. and international residents in the countries Apothica ships to. 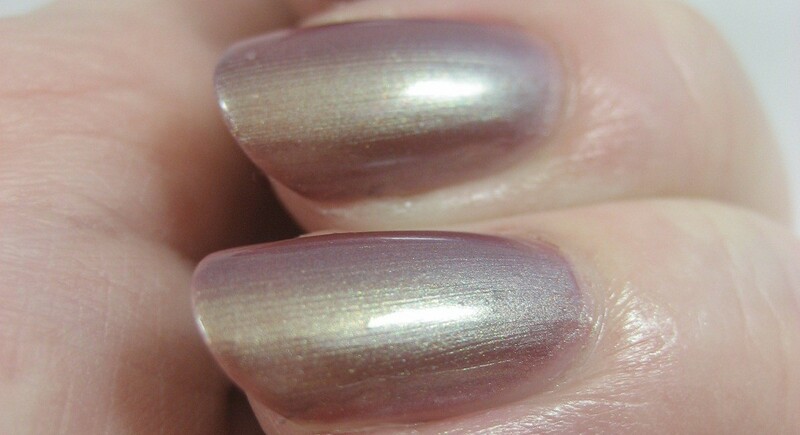 The polishes shown in this entry were purchased with a gift certificate provided to me for free by Apothica. The prize in this contest is being provided by Apothica. The first wheel for this episode of Nail Wheel Wednesday is an update rather than something entirely new. Wheel K1 made an appearance back in March when I painted it with the pink and red cremes left after I'd put all the other ones on wheels. 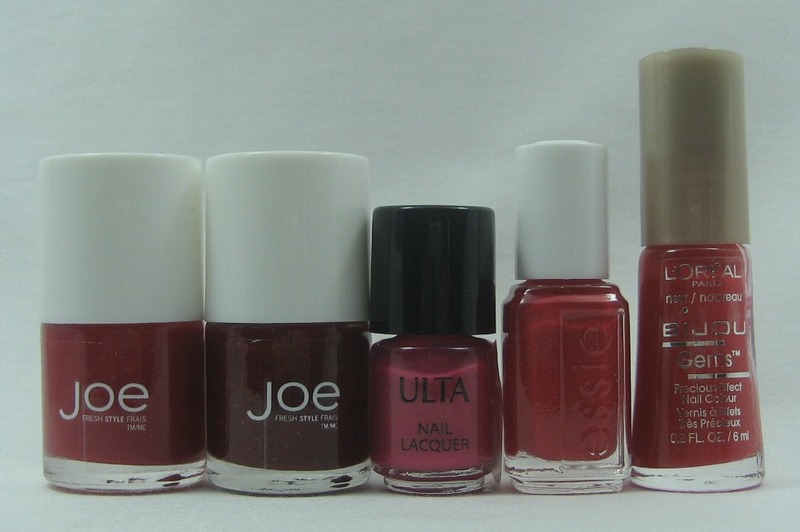 Somehow I've now filled it up, despite having put myself on a no buy for pinks and reds. Some of the additional ones were bottles I found in the wrong spot in my Helmers—a pink creme hiding in the shimmers, say. Some were swap goodies, which isn't buying exactly. 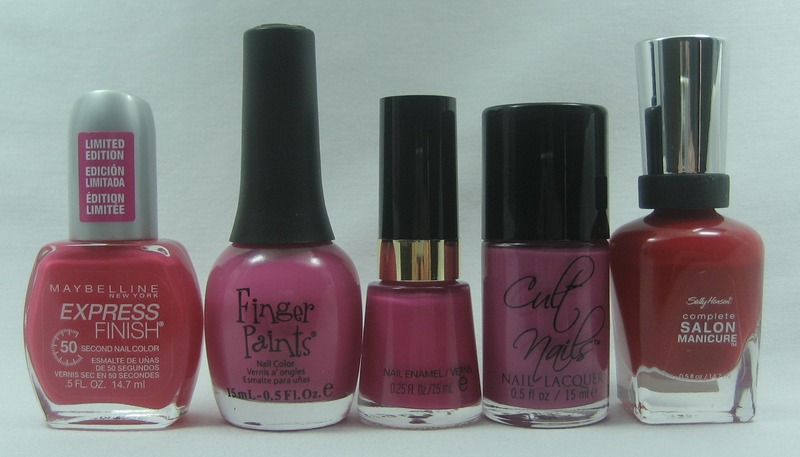 Some came with a set, so I couldn't buy the non-pinks without getting the pink. A few I did buy, because once I've bought most of a collection, I feel I might as well complete it. This second wheel is just more of the pink shimmers that led me to put myself on that no buy in the first place. It'll be a while before I get to the last of these, since I tend to buy more shimmers than cremes since shimmers vary so much even when they have the same base color. It's the same reason I have a lot more patterned fabrics in my stash than I do solids—the patterns hold my interest longer. 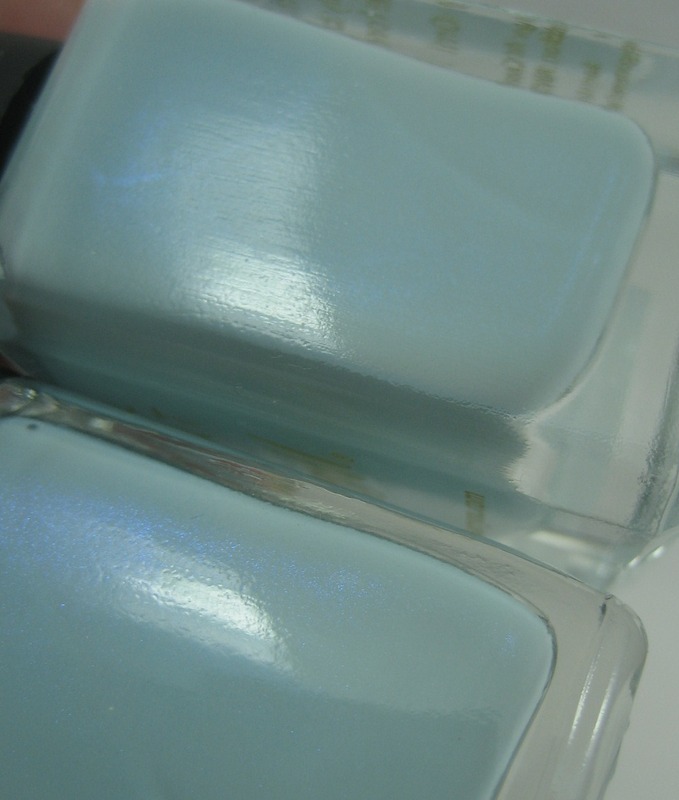 When I put Riva in the comparison spotlight earlier this month, I teased that I had Barry M Blue Moon to try as well once my swap partner got her goodies from me. She did, so I was free to give it a go. 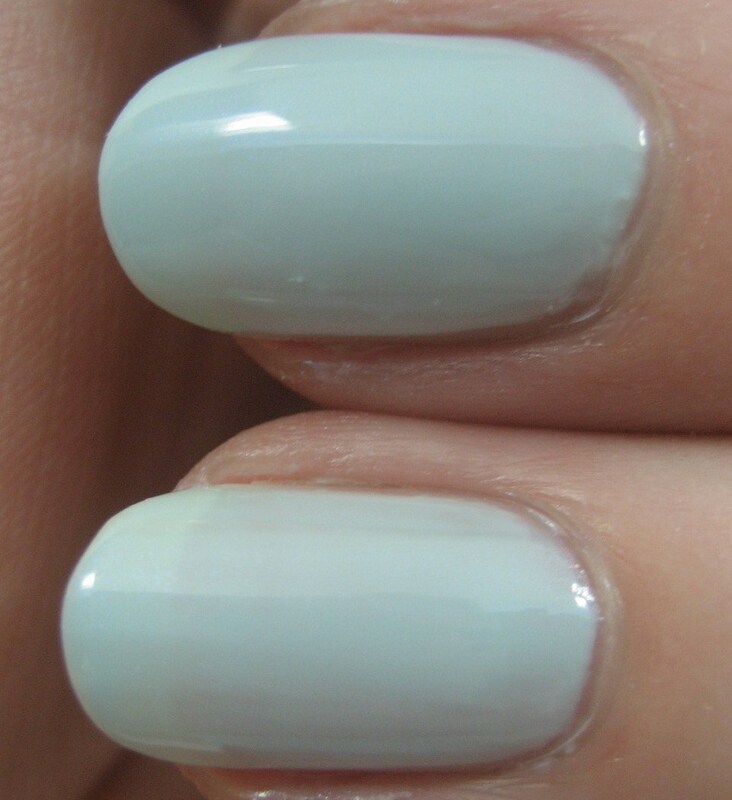 Based on Barry M's success in copy Paradoxal, I had high hopes for Blue Moon. Based on the bottles, the two look really close. Blue Moon (top), Riva (bottom). 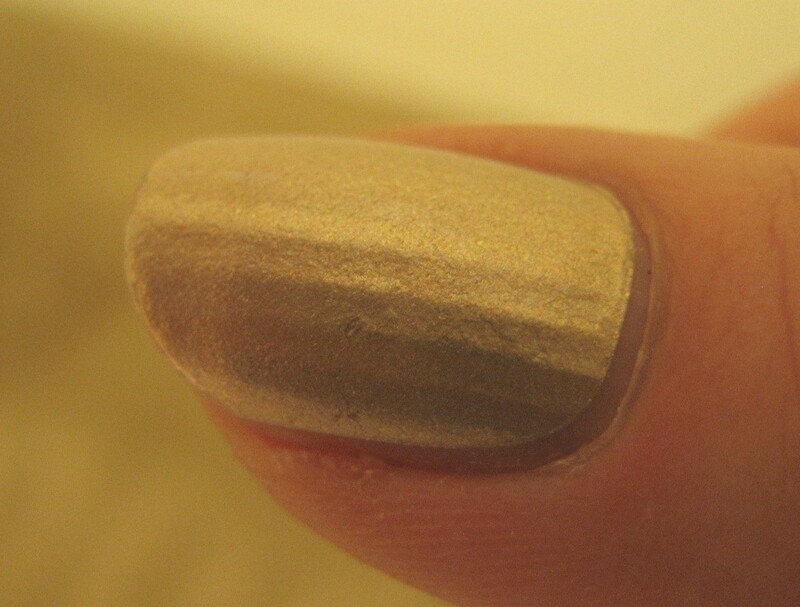 On the nail, at three coats each, the only difference I could see was in the opacity. Top to bottom: Riva, Blue Moon, Riva, Blue Moon. 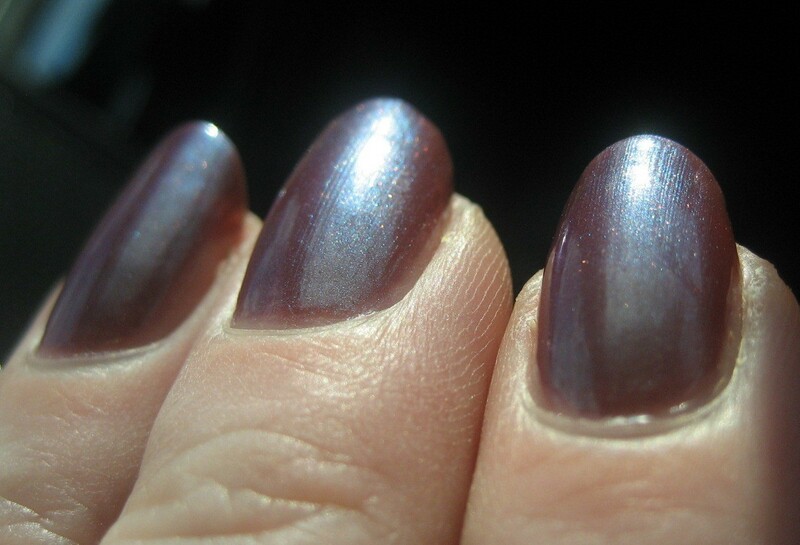 When I went to four coats each, the difference was lessened, though still visible. 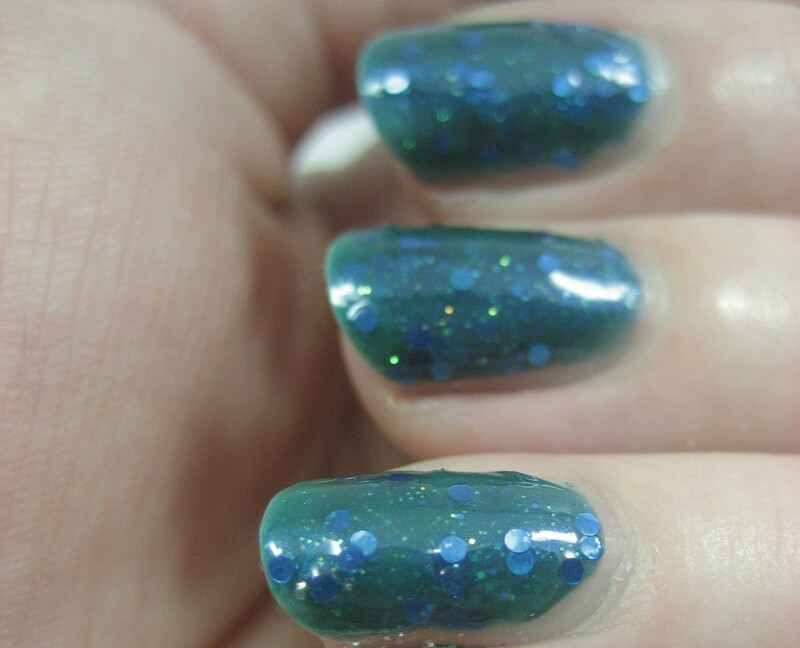 I'm not sure why I didn't think to do 3 coats of Blue Moon and 4 of Riva; that would have been closer still. 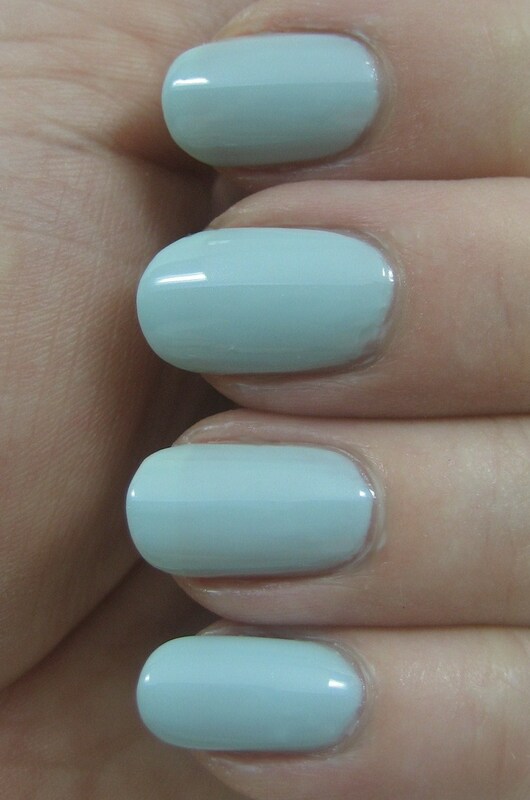 For me, Blue Moon is a fine alternative to Riva, slightly better than Hard Candy Sky because the base color seems a bit of a better match. I wonder if Barry M is working on a Mimosa copy now. Because I am perpetually behind on posting my nails of the day, it's only now that I'm getting to what I wore to my niece's wedding in the middle of June. I mentioned when I got back from that trip that my nails didn't look so great. Since I was not the bride, the state of my manicure was not important, but I was bothered nonetheless. My naked nails were in pretty decent shape when I started my wedding weekend manicure; that wasn't the problem. 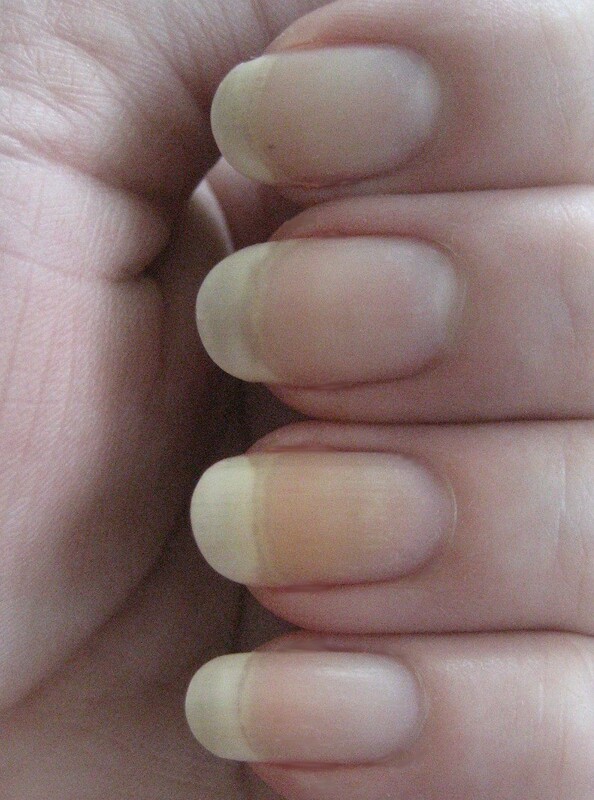 I had hints of peeling on some nails, but nothing that a file and buffer couldn't take care of. There was also still some staining remaining on my ring finger, which would be hidden completely since I wasn't planning on wearing anything sheer. 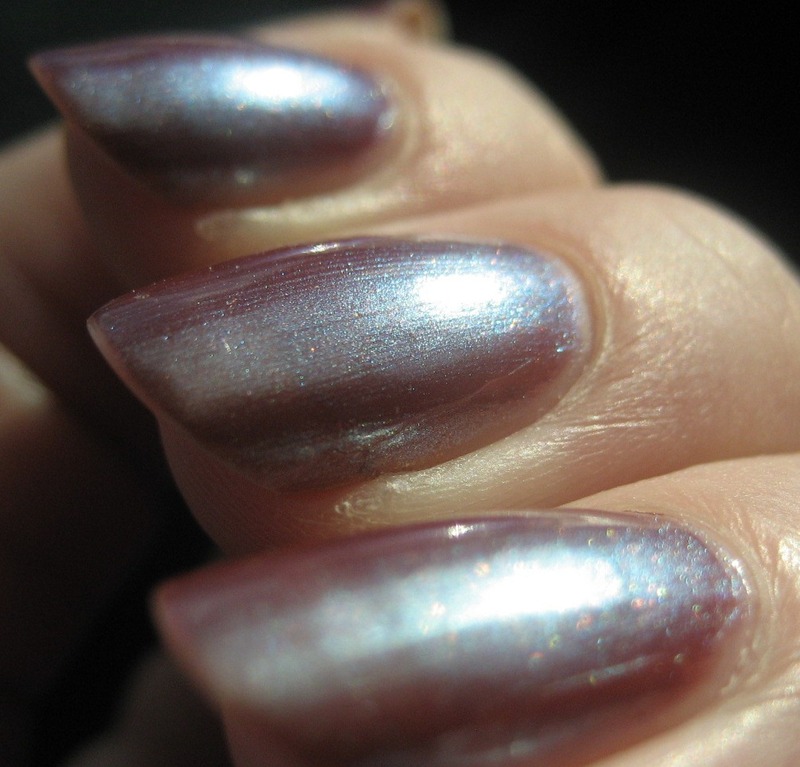 The photo above was taken in natural light coming in the window rather than in my trusty lightbox, which offers a clue about the root cause of one of my problems with this manicure. I hadn't setup my lightbox because I didn't have time. I didn't have time because I'd put off doing my nails until just before I had to get in the car and drive to Chicagoland. 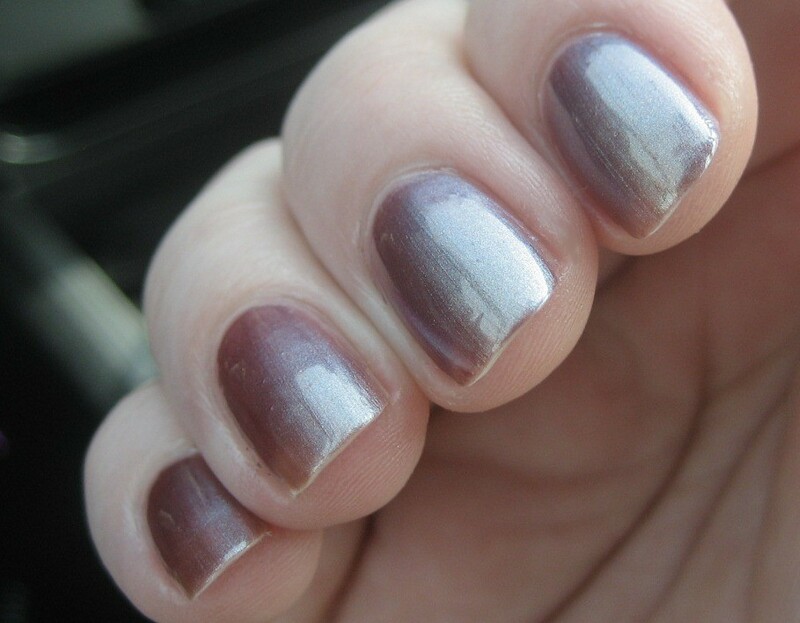 Because I'd soon be loading luggage into the trunk and fiddling with car keys and sunglasses and such, chances were high that I'd dent fresh polish, even with a quick dry topcoat, so I turned to the Sally Hansen strips that I've been happy with both the first time and second time I tried them. Quick to do, and no drying time: perfect for this situation. I chose the plain gold ones, called Raise a Glass, as they would complement the busily-patterned flowered dress I was wearing to the wedding and wouldn't be so flashy as to draw criticism from the distant and cranky ex-relatives who'd be there. The design/color was a good call, but these particular strips didn't apply nearly as nicely as the others I'd used. They felt thinner, which made them more prone to rip and harder to work with in general. I can only imagine that the process which prints the designs, like the flowers or the fishnet, adds a layer of thickness that helps make them more manageable. 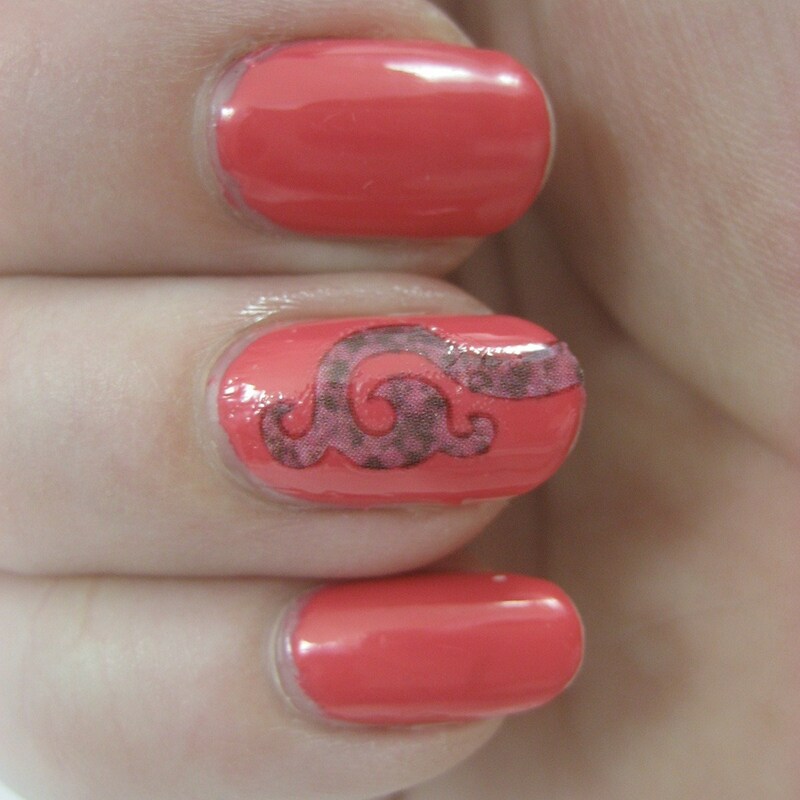 I did my best, but I still ended up with major bubbles on some of my nails and all my ridges showing. Maybe if I hadn't been rushing it would have gone better, but that wouldn't have made the strips any thicker. 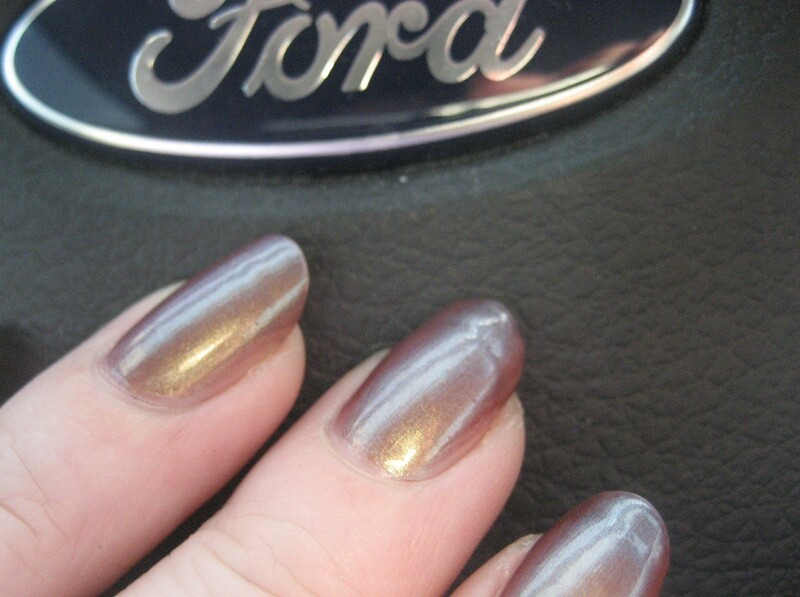 Since I'd left it 'til late, I didn't have time to re-do my nails and just had to live with the obvious flaws. No one said anything or even seemed to notice all weekend, but I wasn't pleased with it and kept trying to smooth the bubbles out with no luck. When I got back home, I was busy catching up from being gone so didn't want to take the time to do a new mani. Instead, I turned to my good friend, glitter, which fixed things right up and put a smile on my face. 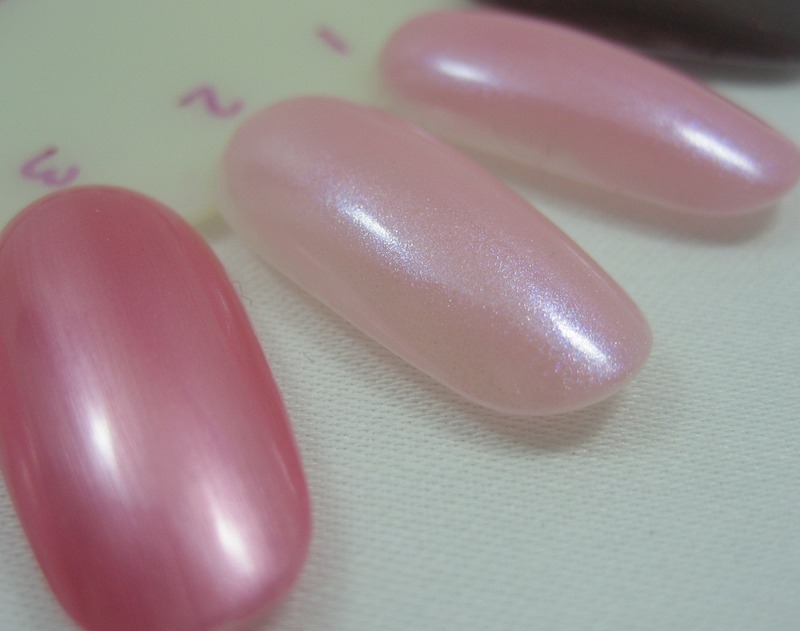 Two coats of Petites Color Fever Pink Diamond over the disappointing strips made it all better. 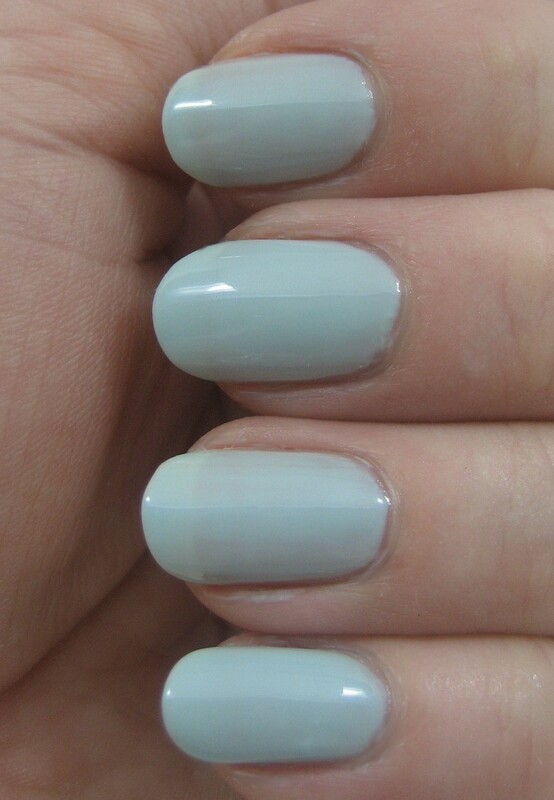 I'll keep using the patterned Sally Hansen strips, but I'm not buying these plain ones again. 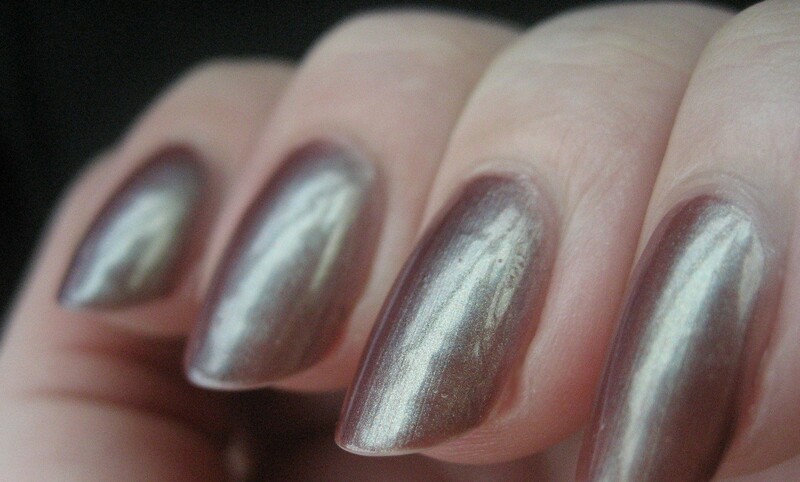 Sure, I could use base coat underneath to deal with the ridges issue, and I bet if I worked very slowly and carefully I could avoid the ripping and bubbles, but if I have the time to do that, I might as well use regular polish and save some money. No sooner did I complete my last display entry than a few new ones showed up. Rather than wait to compile another big entry, I thought I'd just share them now. 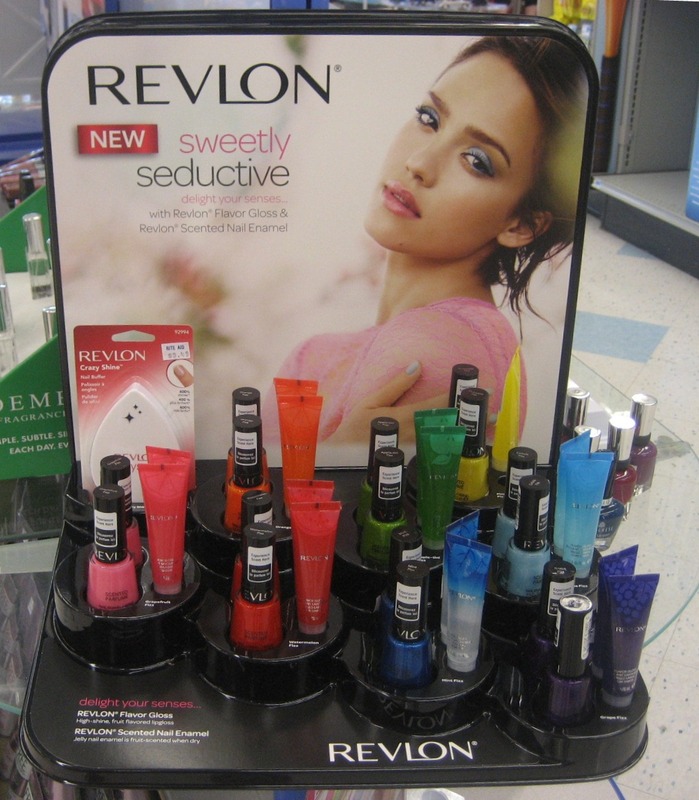 First, Revlon has Sweetly Seductive, which has eight glass flecked shimmer scented polishes, each with a coordinated "Flavor Gloss". The polishes are Grapefruit Fizz (pink), Watermelon Fizz (warm red), Mint Fizz (blue, like gum, I guess), Grape Fizz (purple), Orange Fizz (bet you can guess), Apple-tini Fizz (green), Colada Fizz (light blue), and Pineapple Fizz (yellow). Wow, that was a rant. Sorry about that; I just get so annoyed when I have to argue to get advertised prices. Moving on now. At Walgreens, I saw something from Sinful called Get Swirling. As with all Sinful displays, it's unclear to me if these are new colors, re-promotes with new names, or old colors. 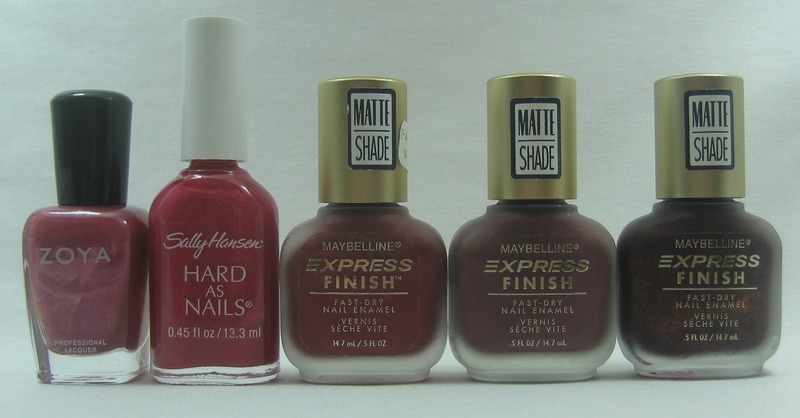 Left to right, colors are: Soul Mate, Happy Ending, Pink (I like the simplicity of that), Ciao Bella, Pull Over, Paradise, Dream On, and Irish Green (definitely an old color; it's been in the St. Patrick's display for at least the last couple of years). 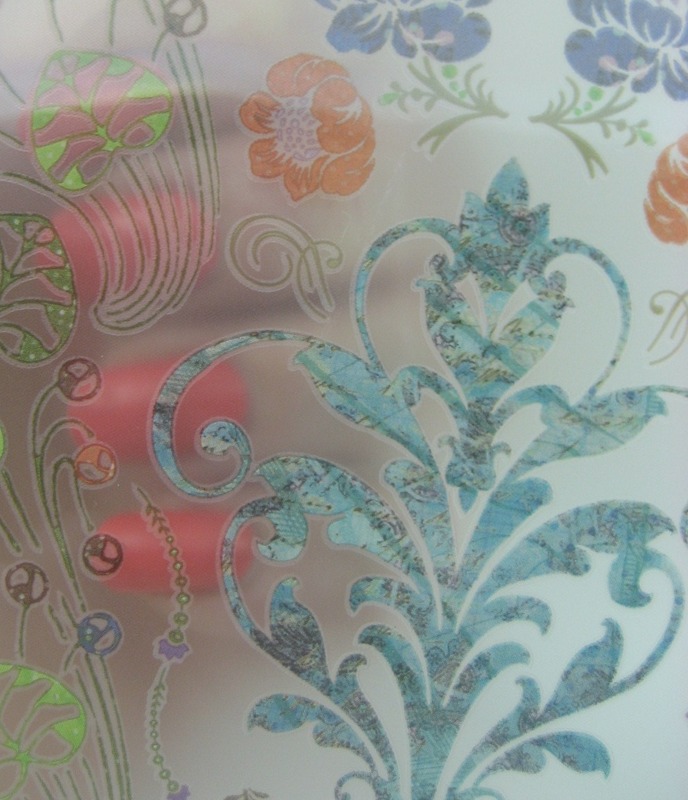 The display has a tear off pad of instructions on "How to do Swirling", which were quite similar to the Milani paint, drop, and drag marbling ones from last display post. The odd part is neither the main display photo or the small inset one show what's being described on the instructions. Dear Sinful, you confuse me. 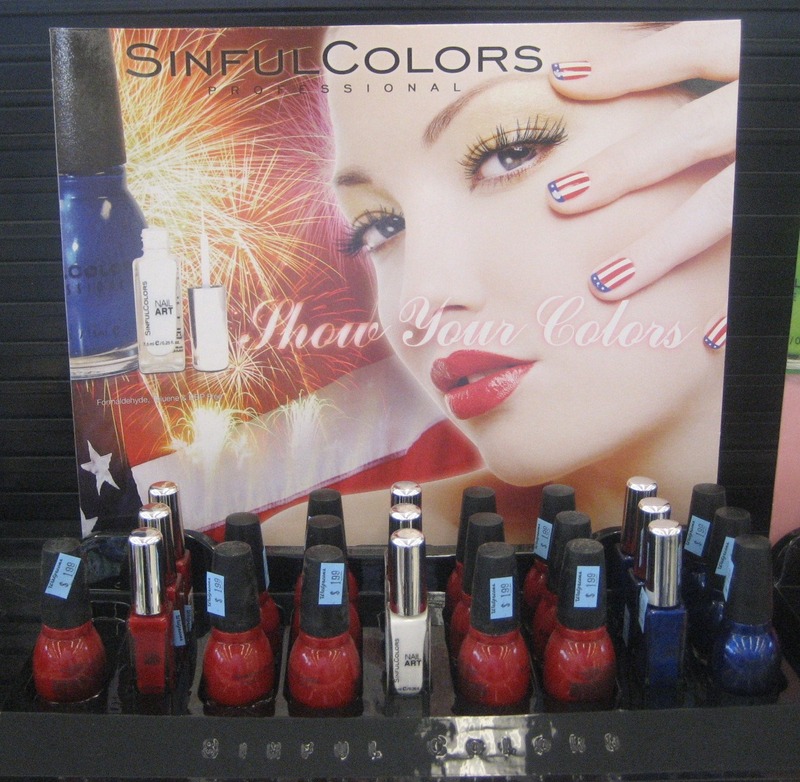 Right next to Get Swirling was the Sinful Show Your Colors display, which does not confuse me too much, as I saw pretty much the same one last year (maybe Walgreens keeps it in the back room). I could use instructions for the look shown here, but there were none. 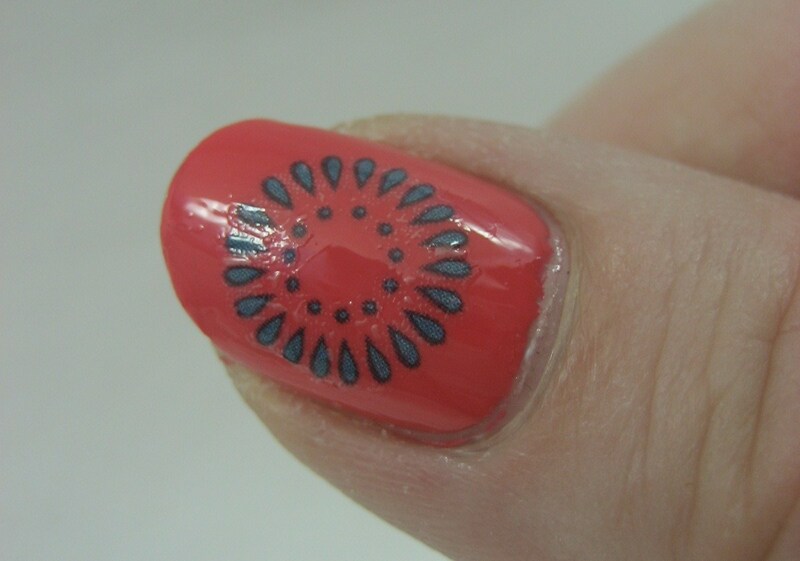 I guess I'd lay down a base of white (though there's no white polish in the display, only a striper), make stripes with red (probably using a striper, but maybe tape and regular polish), do the tip with blue (probably with regular polish), and add dots with a white striper. 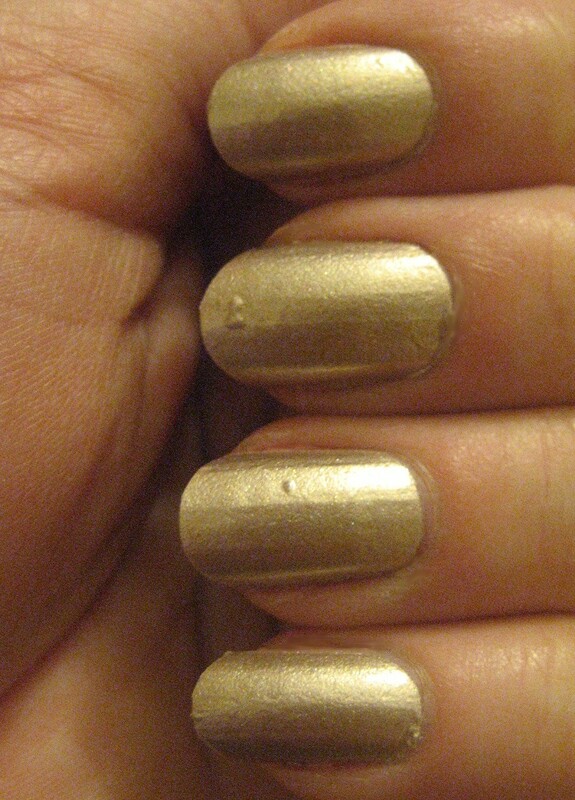 My Sally Beauty store had the China Glaze Crackle Metals. I'm perilously close to crack overload at this point, but these sure are pretty in the bottle. Six colors here: Cracked Medallion, Haute Metal, Latticed Lilac, Oxidized Aqua, Platinum Pieces, Tarnished Gold. 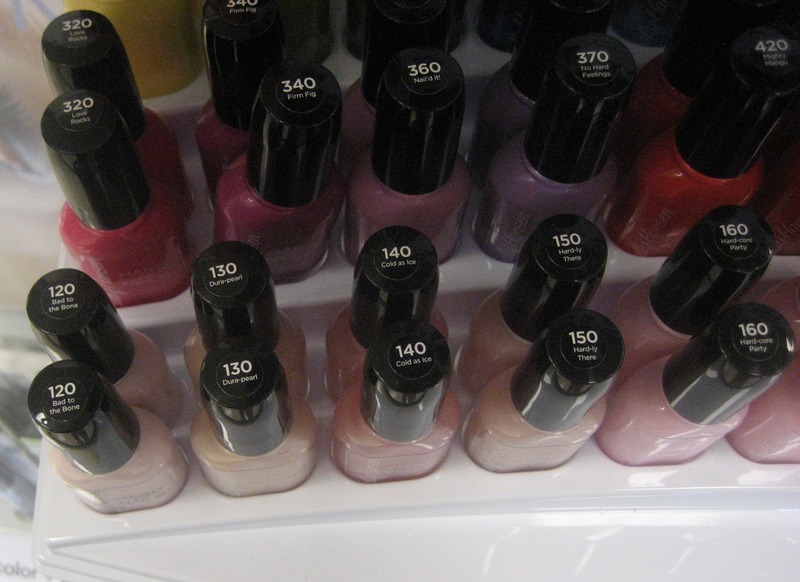 Finally, I know I showed you the new Sally Hansen Hard as Nails display last time, but I happened upon another one that was not only completely full, but the polishes had been arranged in numerical order. This delighted the obsessive compulsive in me to no end! 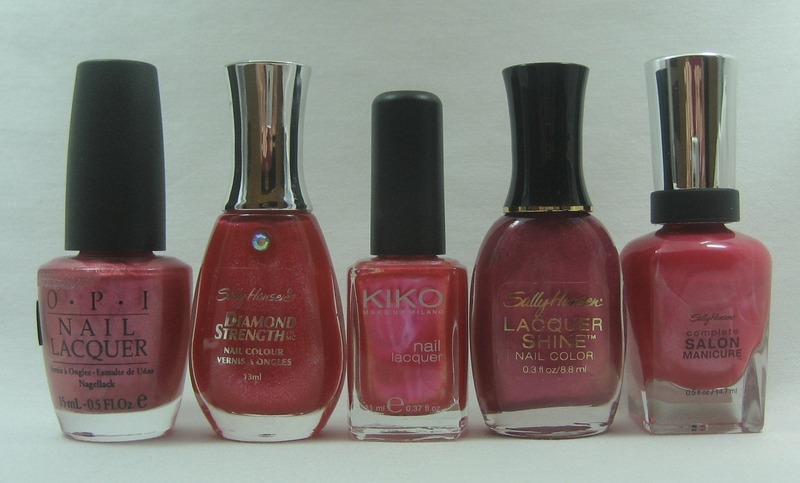 When transcribing that list, I went to the Sally Hansen website to double check a couple of the names where my photo was blurry and found they still have the old lineup posted. 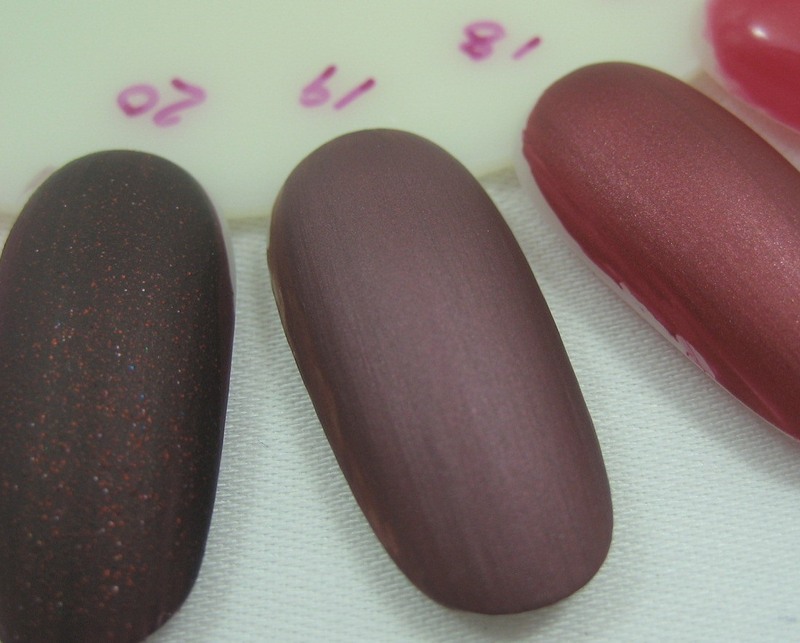 It seems a bit odd that I have a more current list of Hard as Nails colors than the official website but I'm not especially surprised; I don't tend to look to company websites for the latest nail news. 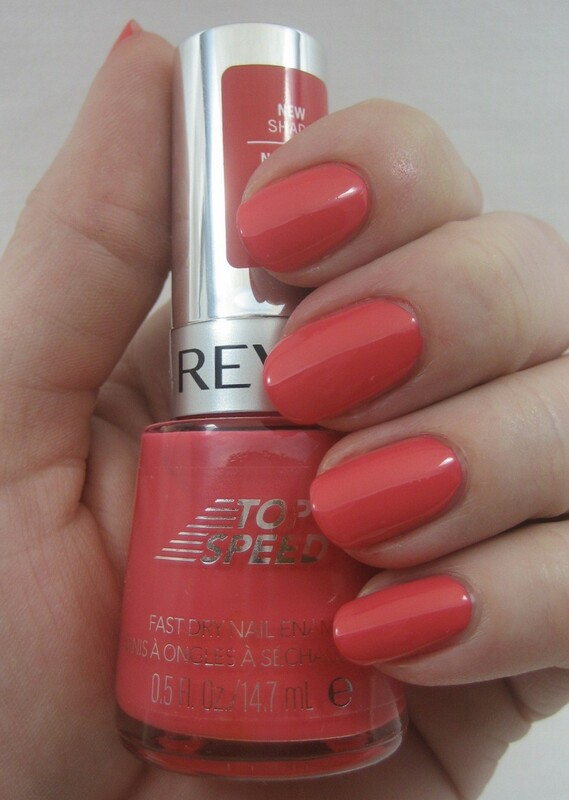 Mock Snob is one of the new Top Speed colors that Revlon released recently. 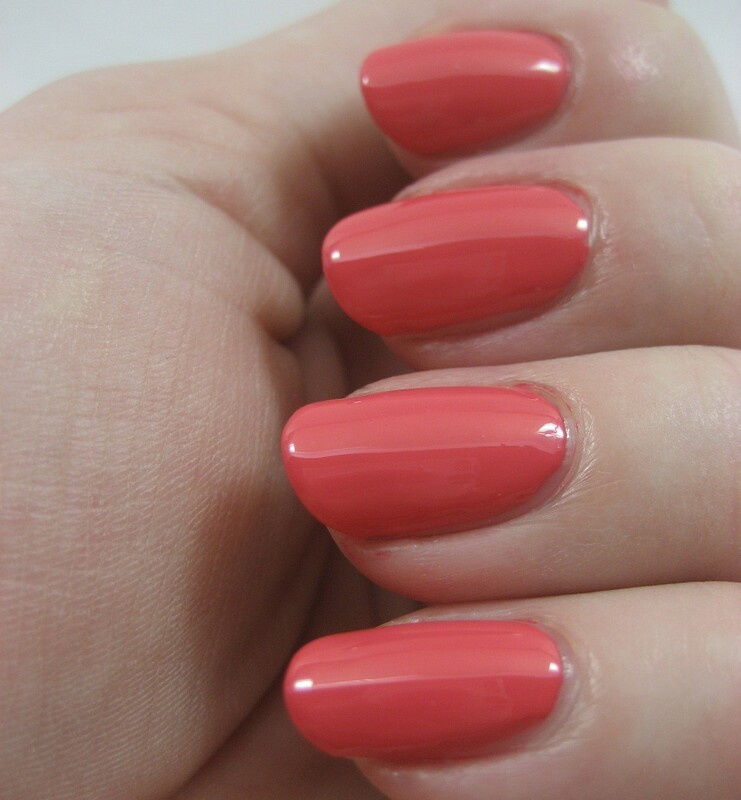 I've no idea what the name means or why it was given to this coral creme, but I liked this summery shade so used it for a full mani. I applied three coats (plus top coat) but probably could have stopped at two. After a few days, I got bored with this all one color, plain creme finish, matching fingers look so decided to try something I'd never done before: using scrapbooking rub ons as nail decals. 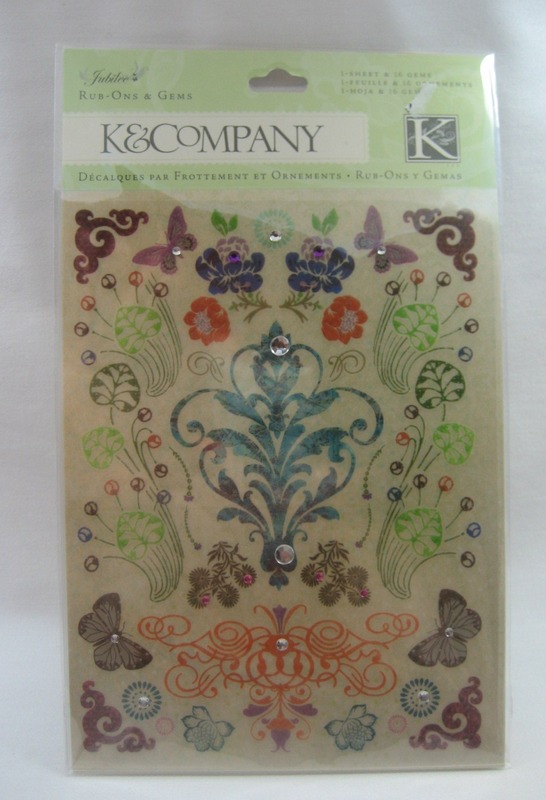 I believe I first saw this idea on Another Bottle of Polish; it lurked in the back of my brain until I was at JoAnn Fabrics recently to get supplies for a clothing repair project and happened to notice signs for 40% off scrapbook stuff. I picked up one set of rub ons to try. This particular set came with gems, which were stuck to a sheet separate from the rub ons themselves, though I didn't know they were separate until I opened the package. 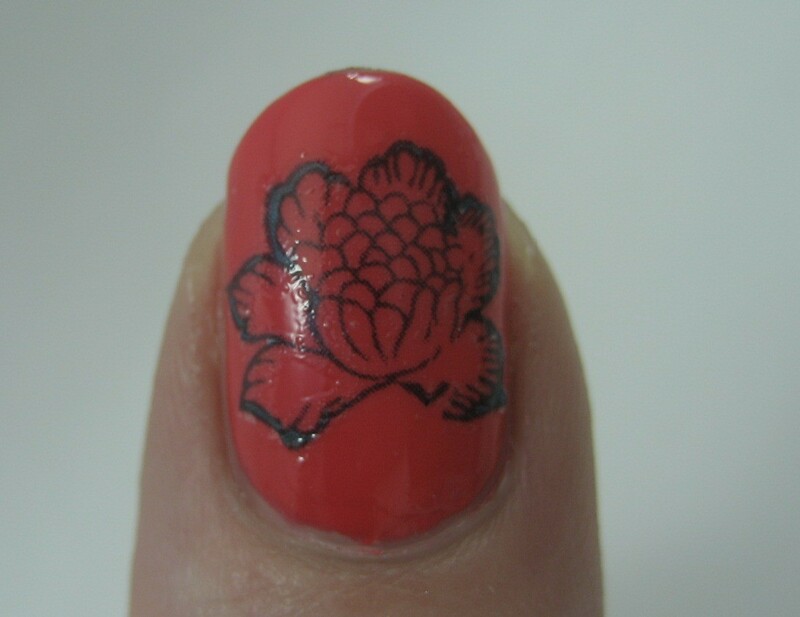 Following the instructions on the package, I cut out the first motif I wanted to try, a single flower. Continuing to follow the instructions, I used the enclosed stick to rub the decal off the backing after I put it on my nail, which didn't work so well. 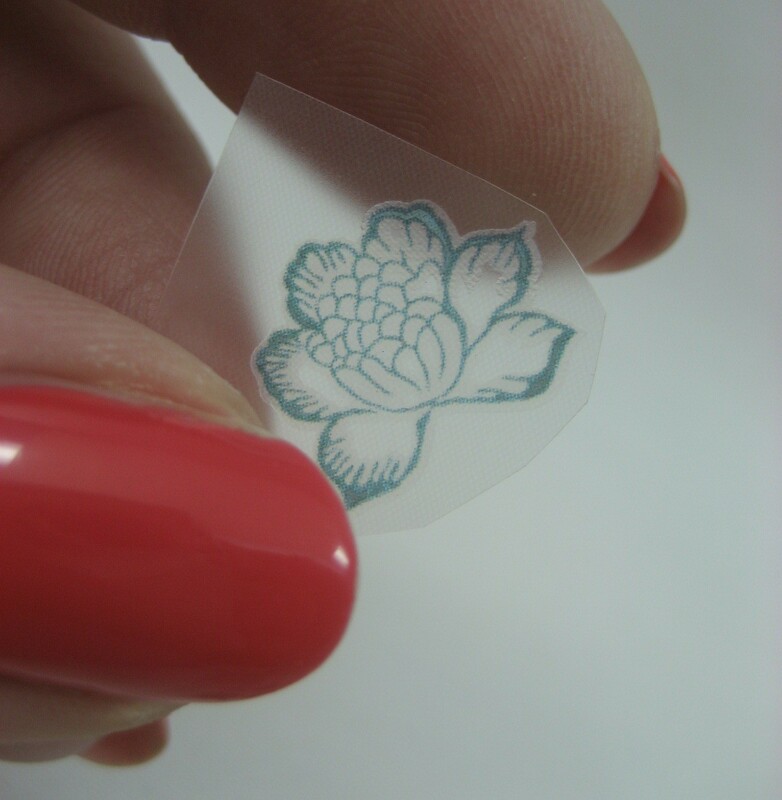 The backing was not flexible enough to easily bend to the shape of my nail and the decal was delicate, so I ended up ripping the decal when the backing sprung up unexpectedly. 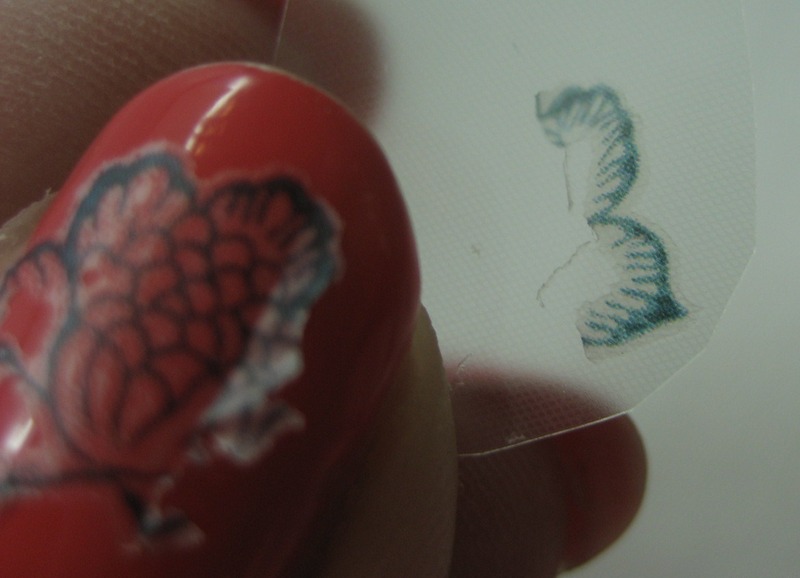 On subsequent nails, I experimented with transferring the decal from the backing to my nail by rolling the backing across my nail similar to rolling a Konad stamper. I was able to fix the first flower this way, too. Only then did I rub with the stick, though I found the smoothest side of a buffer block worked as well if not better for that task. I did have the same centering issues I have with stamping, but that'll get better with practice. For my ring fingers, I cut apart one of the bigger motifs from the sheet and used half on each hand. 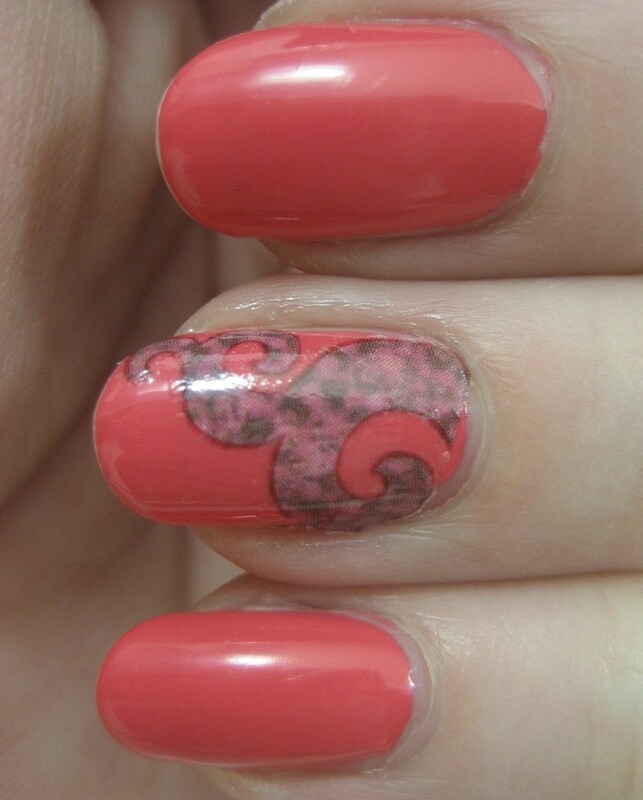 Once the images were on my nails and rubbed down, I added top coat. I had the rub ons on for three days and they stayed put, no lifting at all. I did get some wicked tipwear on the nail where the rub on went right to the edge of my nail, but that went only so far and then stopped. I can see a few bubbles and wrinkles in these photos, but I was pleased enough with the effect that I'm planning to try this again soon.